Primary Activity: Hiking and kayaking, rescues, fixing electronics, meeting angry, confused bears. I have a deep background in electronics — among other things I designed electronics for the NASA Space Shuttle. And I'm reluctant to throw electronics away if I think there's a chance to perform a simple repair. The prevailing belief about boat electronics is that the wet, salty, mildewy nautical environment quickly destroys electronics, and the most effective remedy is to replace gear that begins to act up. This is sometimes the best approach, but in a surprising number of cases a simple repair can bring electronic devices back from the dead. 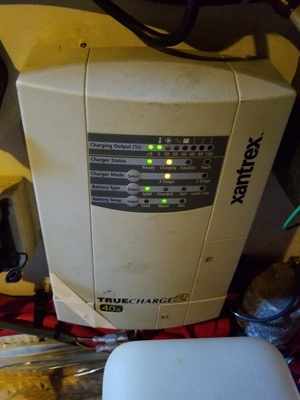 The above image shows the charger operating normally after I performed the repair I describe below. Before the fix, it showed flashing error lights and refused to charge my batteries. The basic premise of this repair method is that modern electronics are quite reliable but only if they can be protected from some combination of mildew, mold and moisture, and in many cases cleaning circuit boards is an effective remedy. Manufacturers could address this issue at the factory by coating their circuit boards with an insulating film to expel mildew and moisture, but this is a pretty expensive process and it makes subsequent testing and repair more difficult. So that's almost never done. Consequently, electronic gear that lives on boats year-round frequently fails just because of wide temperature swings, dampness and mildew, and in many cases if the circuit boards could be thoroughly cleaned and dried, the gear would start functioning again. 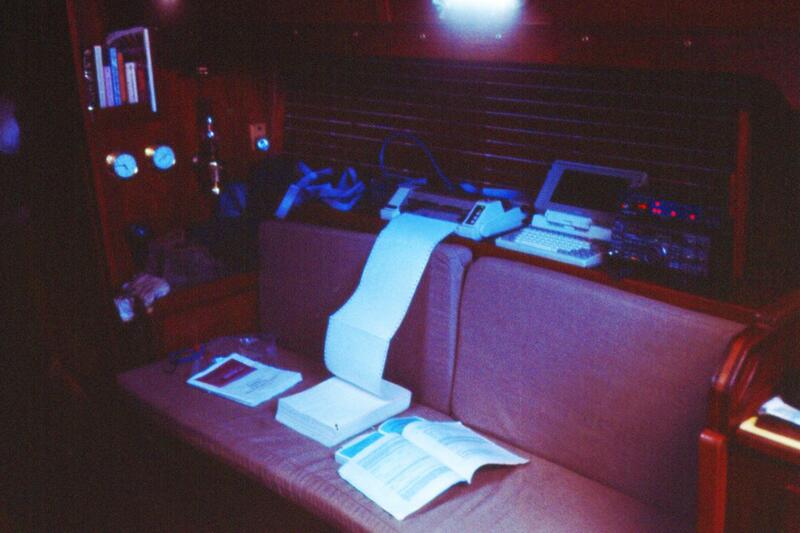 I first tried this method many years ago on my little sailboat during an around-the-world solo sail when my weather chart printer (see above, center) stopped functioning. I really needed that printer to remain operational so I could track marine weather during long ocean sails. I had some cleaning alcohol on board, so I disassembled the printer, isolated the circuit board, and poured alcohol on it. A few vigorous shakes followed by some careful wiping with paper towels and the printer came back from the dead. I performed almost exactly the same repair just recently on a new astronomical telescope, which after only a few months of service began to show erratic behavior. I noticed the problem was most severe on cold nights while observing outdoors, and wasn't nearly as severe in a warm environment. So, as with the printer, I disassembled the telescope and its remote control, cleaned the circuit boards with contact cleaner (better than alcohol), wiped, dried, reassembled and the symptoms disappeared. 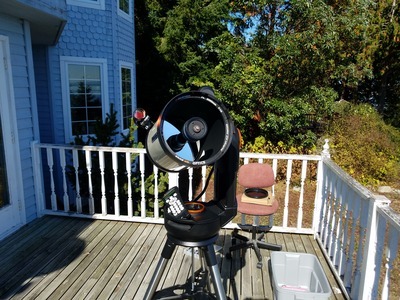 The telescope had a factory-caused problem — there was some solder flux residue on one circuit board, an invitation to collect mildew and moisture. Contact cleaner was an ideal remedy because it efficiently dissolves this kind of deposit, then evaporates, leaving no residue. This was clearly a quality control issue at Celestron — leaving dirt or flux on circuit boards is just asking for warranty problems in gear that has to tolerate wide temperature ranges and occasional moisture. As a first step, remove power from the device — house or battery power, doesn't matter, remove it. Completely disassemble the device, taking pictures of its assembled form including connectors and wires so you have a chance to reassemble it correctly. Isolate circuit boards to the maximum practical extent. Spray the circuit boards with electronic contact cleaner, a product that's ideal for this repair method because it evaporates with no residue. If there's any visible dirt or solder flux on the circuit boards, clean it off and spray again. Make sure the circuit boards are completely clean and dry before reassembly. The key to this repair is electronic contact cleaner, a product easily acquired online (generic search link). These products are very much alike, all of them should be used in a well-ventilated area, and be careful — most are highly flammable. The above are only a few of many cases where I was able to restore failed electronics to a working state with this simple procedure.